This small plan was published in the London Magazine in 1760. The title appears at bottom left, with scale bars at bottom right and compass star at top right. 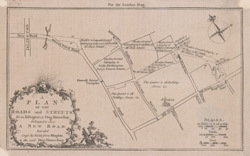 The intended extension from Angel to Old Street is indicated by a double dotted line, with St. Luke's Church represented pictorially. Built by the Duke of Grafton in 1756 to drive cattle east to Smithfield Market, avoiding Holborn and Oxford Street, this was the capital's first bypass.